There is no top limit to trust, and this word ‘trust’ was one of the key words in the Diary of St Faustina. It is pleasing to God that the soul has living faith and living trust. Therefore, it is important to feed our soul by reading the writings of St Faustina because by not feeding our souls we will become weaker day by day spiritually. Faith comes from hearing; so when people do not listen to the word of God or if we do not read spiritual books people can become influenced by the secular world of today. We have to protect and defend our souls from it by persevering in prayer, faith and trust. Trust is a dynamic active word. St Faustina wanted everyone to experience the love of God and each word written in the Diary is so precious. One of the most frequent words written is ‘love’, her love for God and His love for us and all of mankind. Jesus loves us and is helping us to grow in trust and mercy. In His goodness He instructed St Michael to protect St Faustina because of her special mission on earth to write the Diary, which is the main source of knowledge of the Divine Mercy. 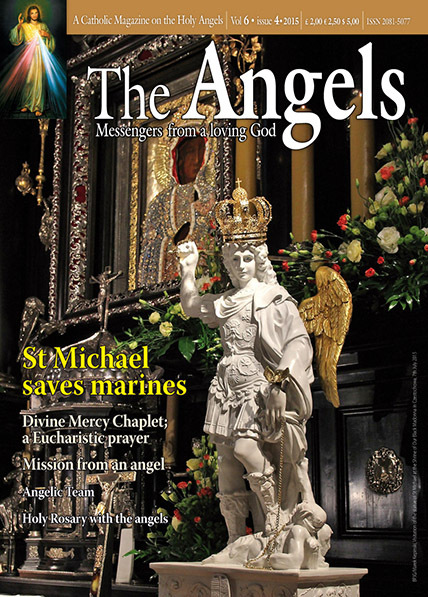 There is a renewal of interest in St Michael the Archangel and many people want to become followers of the devotion to him and become knights. Jesus wanted St Faustina to become a knight and fight for the salvation of souls. If you become more advanced in the Divine Mercy spirit, it makes you become more courageous and you know then that this is a spiritual fight and it is not easy. St Faustina had a daily battle. The first rule of the spiritual fight is to have faith in victory. Many people are taking up this battle and we can call on God because of our trust in Him and that we trust that St Michael will help us. Jesus I trust in you.